Hey there, JLC fans! Long time, no post. 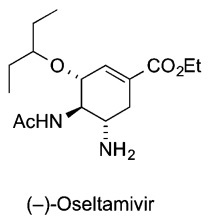 Today's inspiration comes from a molecule I've enjoyed watching the synthetic, process, and educational chemistry communities go to town on for the past 18 years: (-)-oseltamivir, also known by the trade name Tamiflu. See that cyclohexene in the middle? This molecule mimics the transition state of a mostly-flat oxonium cation derived from sialic acid, so well that it interrupts the flu virus's ability to release further infectious particles, allowing the body to "catch up" and reduce overall time spent hovered over a steaming bowl of chicken noodle soup. But enough about the Why, let's get to the How; as the authors of this paper pitch in their opening line: Time is Money! Compare that against the benchmark of the previous 1-pot reaction - 57 hours. Wow! Several interesting modifications to their previous syntheses have enabled this savings. First, addition of a hydrogen-bond donor catalyst to a nitro-Michael addition, which accelerates the reaction 3x. Second, swap of a base in an HWE reaction: 3.5 hours in cesium carbonate becomes 20 mins in tBuOK. Finally, a sacrificial move - rapid epimerization of the penultimate nitrohexene, knowing that only 50% of the product will successfully reduce to the desired diastereomer. ** A short silica column completes the rapid realization of this antiviral drug. Lest you believe that I'm hornswoggled by a synthetic sprint, a quick glance at the Supporting Info*** provides a cold shower. There's some lingering impurities in those 1H NMRs, enough to make me believe that the yield, even at gram-scale, isn't really 16%. And the reagent equivalencies used to drive these nitro-boosters aren't pretty: 30 parts Zn, 3 parts phosphonate, 15 aliquots of TMSCl. To touch upon an allusion the authors themselves make - perhaps a Jamison-style flow reactor is the next logical step for this speed-demon of a route. *As I wrote this line, I couldn't stop comparing this to other "just 1 hour!" claims from consumer products: teeth whitening, photo development, tax preparation, LensCrafters, oil changes, and pizza delivery can all refer to the 2016 Hayashi Tamiflu synthesis as a spiritual brother of sorts. **I don't believe that there's a spontaneous kinetic resolution here, but if any sharp-eyed reader can prove differently, I'm all ears. ***Counter-counterpoint: The one-pot is so streamlined that it now takes only 281 words to synthesize Tamiflu. Who is this masked chemist? Finding my way through new challenges. 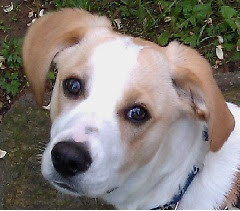 I was a founding blogger at Scientific American's Food Matters and Blog Syn. I once wrote for C&EN's The Haystack. I've written for Nature Chemistry, Newscripts, Chemistry Blog, Chemjobber, and Totally Synthetic. DOC Logo? Fixed that for you! 2016 - "Reading JLC is like chatting with the most interesting person at a party" Thanks, ACS Axial! All text copyright See Arr Oh 2011-2017. Simple theme. Theme images by gaffera. Powered by Blogger.